Kibera is one of the oldest and biggest slum communities in the world, with a population of close to one million people. Most people living in Kibera have little or no access to basic necessities such as electricity, clean water, garbage removal and sewage disposal. There are also over 50,000 AIDS orphans surviving in Kibera, often cared for by grandparents, overcrowded orphanages, or left alone to fend for themselves. For these and all children in Kibera, schooling is rare and when available, the physical condition of the classrooms is highly inadequate. 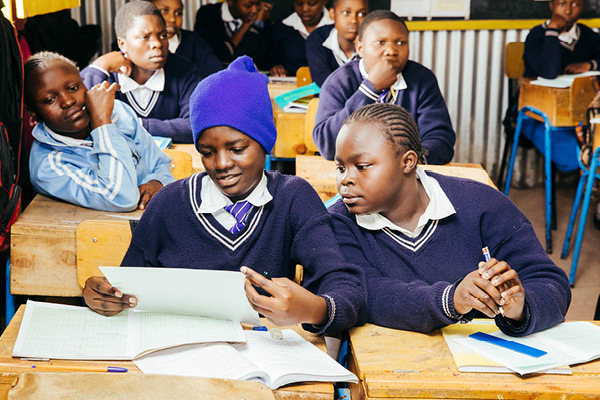 One of our key focus areas is providing secondary school scholarships for girls living in the slums. With a One Girl Can scholarship they become full time boarders and can escape the violence and poverty of the slum. Many girls from Ushirika Elementary School are now winning One Girl Can scholarships. We have also just started providing scholarships for students at Ushirika's new secondary school.